Sometimes I have time to sit while my children are otherwise occupied (the girls are in the shower right now, for instance... having lots of fun! ), and I like to look through the blog recommendations from Google Reader. I like to see what new quilt blogs it recommends to me, and sometimes I stumble upon some that have lots of inspiring photos of beautiful quilts. Honestly, there isn't enough time in my life to make all the beautiful quilts I see and covet! I thought I would share a couple of my favorites with you, in case you have a little down time too! Material Obsession - This blog is run by two women in Australia who also own a quilt shop, and design quilt patterns. In fact, if their book wasn't so darn expensive in American dollars, I would definitely be adding it to my book stash. I love how they combine color and pattern to make beautiful quilts. Tree Fall Design - Manda, the writer for this blog, is the editor of the new magazine Sew Hip. I don't think the first issue has come out yet, but it promises to be full of beautiful pictures and great articles. 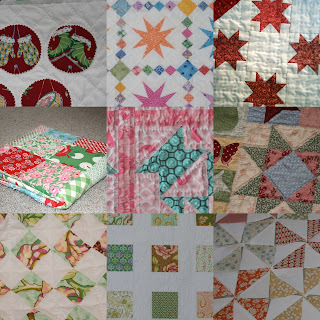 Manda has many beautiful quilts on her blog, and I especially love her use of red and pink together so much. These are two of my favorite colors! My triangles are slowly but surely becoming pinwheels, in fact a little over half of them have been pieced together. I am very excited about this quilt again... While trying to figure out which layout I wanted to go with, I was beginning to tire of it, but once I decided on triangles, I was excited to sew again. Definitely excited to get working on my next quit, made with the Heather Bailey fabrics I won, and extras I have added to the stash... I should finish the triangle quilt top this weekend, so I will be able to get two quilts to my mom when my parents comes out here in October. And I mean sewer, as in sewing, not sewer as in pee.